Configuring multiple ISCSI Connections for Multipath IO using PowerShell. | Chinny Chukwudozie, Cloud Solutions. ← Configuring Hyper-v Host Network Adapters for ISCSI Storage Connectivity with Powershell . This post will be focused mainly on the ISCSI Initiator host and configuring multipath IO paths to an ISCSI Target. The ISCSI Target portal has already been configured with 2 network paths for ISCSI. At this point, the ISCSI Target connection is still in a disconnected state as indicated in the screenshot. Installing and Configuring Multipath IO Feature and ISCSI Initiator. WARNING: Settings changed, reboot required. We will go ahead and restart the server after configuring the disk timeout value. We observe that the ISCSI connections were made using the Network Adapters specifically configured for storage. A previous post shows how to configure Network Adapters for storage by tweaking the component bindings and DNS registration properties. Viewing the current ISCSI Sessions, shows the sessions are persistent across reboots. I decided to test the multipath configuration to the new Volume and the Round Robin Load Balancing policy. I created a 5GB file and prepared to copy the file to the new ISCSI Volume with drive letter E:\. 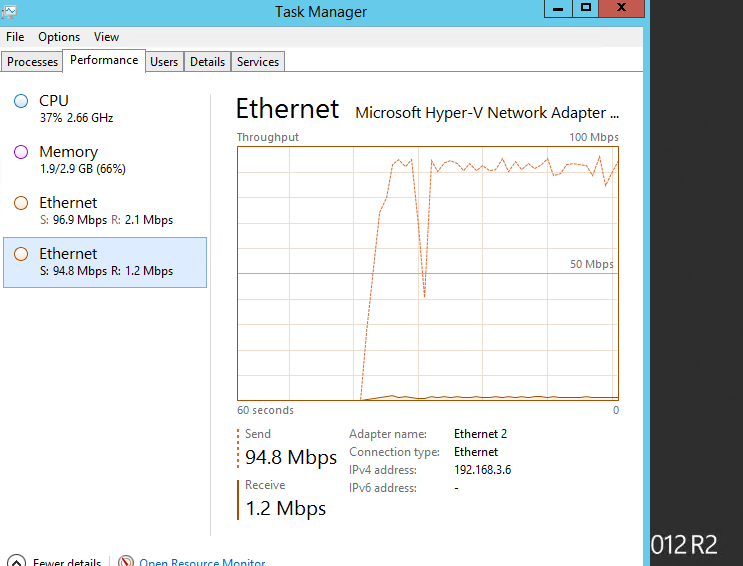 Starting Task Manager and navigating to the Performance tab confirms the presence of the 2 NICs. I disabled NIC 2 . The copy stopped for about 30 seconds, but the file transfer did not close. MPIO detected the failed path and resubmitted the copy on the new available path. After enabling NIC 2, the copy continued on both NICs. I also observed an increase in copy speed/throughput with the Round Robin Load Balance policy. This entry was posted in Hyper-v, Hyper-v 2012 R2, ISCSI, ISCSI Initiator, ISCSI Target, Multipath-IO, PowerShell, PowerShell 3.0, Windows Server 2012, Windows Server 2012 R2 and tagged ISCSI, MPIO, Multipath-IO, Powershell 3.0, Windows PowerShell. Bookmark the permalink. 1 Response to Configuring multiple ISCSI Connections for Multipath IO using PowerShell. Reblogged this on chinny chukwudozie,it pro.